In an entire town where the homes, businesses, and all other structures are dug right out of the ground it takes a site as insane as Crocodile Harry’s Underground Nest & Dugout to stand out with its cacophonous collection of bones, primitive art, and messages from visitors. Not a single witness can attest to the creation of the world's largest geoglyph. 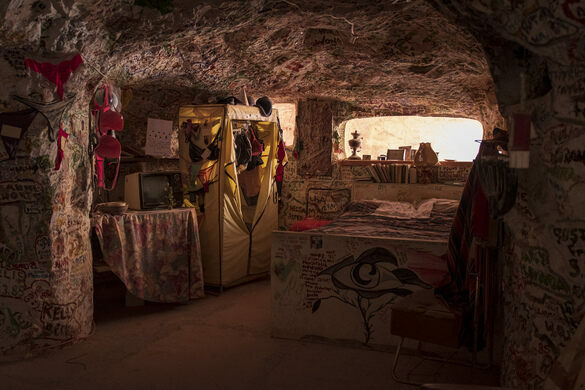 Located in the self-described opal mining capital of the world, Coober Pedy, where all of the structures are built into the cliff-sides and ground due to the intolerable heat in the region, Captain Harry’s former home is unmistakable. The titular captain was actually a crocodile hunter during his life before settling down in Coober Pedy. A notorious personality in the town, Harry was well known for both his insane home and for his love of women. Unfortunately, the iconoclastic rake died in 2006, in the end claiming that he was, in fact, a Latvian baron who had been in hiding since World War II. Luckily Captain Harry’s home remains and has been turned into an attraction for curious visitors to the remote town. The walls of his dugout are covered in all manner of recovered knick-knacks and tribal graffiti, some placed by visitors, but most installed by Harry himself. Many who have visited the house have left their own messages on the rounded walls and ceilings and many of the women who visited while Harry lived say that he would request a little ribald contact for the honor. Crocodile Harry’s Nest & Dugout is one of the most visited places in Coober Pedy but will likely be remembered for its use as a set in such movies as Pitch Black and Mad Max Beyond Thunderdome.